Your carved pumpkin or Halloween jack-o'-lantern doesn't have to rot or mold before Halloween! Here is how to use chemistry to preserve a jack-o'-lantern so that it will last for weeks instead of days. Mix up a preservative solution for your carved pumpkin consisting of 2 teaspoons of household bleach per gallon of water. Fill a sink, bucket, or tub with enough of the bleach solution to totally immerse the carved jack-o'-lantern. Place the jack-o'-lantern in the bleach mixture right after you have finished carving it. Soak the carved pumpkin for 8 hours or overnight. Remove the pumpkin from the liquid and allow it to air dry. Spray the pumpkin inside and outside with a commercial pumpkin preservative or use your own mixture, consisting of 1 teaspoon of bleach in water. Spray the pumpkin once daily, to prevent the growth of bacteria and mold. Smear petroleum jelly on all of the cut surfaces of the pumpkin. This will prevent the pumpkin from drying out and getting that puckered, shriveled look. Protect the jack-o'-lantern from sun or rain, since one will dry the pumpkin out, while the other will promote the growth of mold. If possible, refrigerate your jack-o'-lantern when it's not in use. Bleach is dilute sodium hypochlorite, an oxidizer that kills microorganisms that decay the pumpkin, including mold, fungi, and bacteria. You need to reapply it because it loses its effectiveness fairly quickly. The petroleum jelly locks in moisture so the jack-o'-lantern doesn't get dehydrated. Now that you know how to keep it fresh, make a science Halloween jack-o'-lantern. Another way to make a pumpkin last is to simply wait until it's closer to Halloween to carve it. One idea is to mark the carving for the big event, but not actually cut it. Then coat the entire pumpkin except the areas to be carved with glow-in-the-dark paint. This gives you a glowing pumpkin with dark areas where the carving will go. While bleach reacts with air so that it needs to be reapplied, you can get lasting protection against critters and mold by treating a carved pumpkin with borax. You can either sprinkle borax powder around the interior of the jack-o'-lantern and the carved surfaces or you can dip the pumpkin in a solution of borax in water. If you're concerned about the potential toxicity of bleach or borax (or simply don't have them), you can deter rotting and mold using salt. It doesn't matter whether you use table salt or road salt. You can either soak the pumpkin in brine (saturated saline solution) or else rub salt into the cut surfaces and interior of the jack-o'-lantern. Again, you can seal the pumpkin with petroleum jelly to keep it from shriveling up. Salt prevents rot by dehydrating cells. While salt is a better preservative, sugar also dehydrates cells. The same techniques used for salt may also be applied to sugar. Another good tip is to use care when selecting your pumpkin. If you can, try to select a pumpkin that is fresh and firm. A freshly cut pumpkin won't have a shriveled stem or soft spots anywhere on the fruit. You have a much better chance of keeping a pumpkin until Halloween if it doesn't have an established colony of bacteria and mold. When you carve the pumpkin, clean the inside as well as possible. If you leave any strings or seeds, you're providing extra surface area for microbial growth. It's easier to keep a smooth surface clean than a rough one. While a pumpkin may last weeks or months without rotting, once you carve it, the exposed flesh is susceptible to rot. Decay can be minimized by applying a disinfectant or preservative, such as bleach, salt, or sugar. 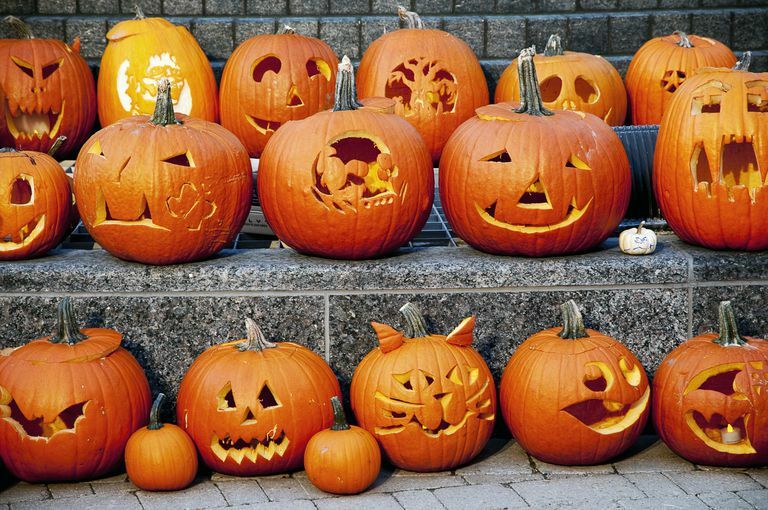 A carved pumpkin can be sealed with oil or petroleum jelly to lock in moisture and minimize puckering. It's important to keep a carved pumpkin cool when it's not in use. Increasing the temperature basically incubates mold and bacteria.